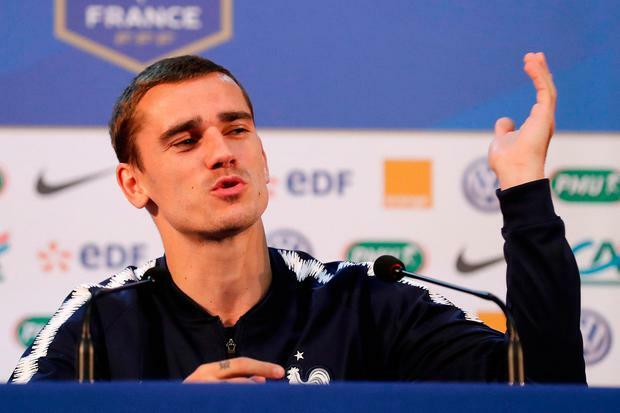 Antoine Griezmann mocked Thibaut Courtois over his "anti-football" jibe against France on Friday, accusing Chelsea of playing the same way under Antonio Conte. After two days in which the World Cup finalists had gone out of their way to avoid a war of words with Courtois and Eden Hazard following their semi-final win over Belgium, Griezmann finally rose to the bait. "Does Thibaut Courtois think he plays Barcelona football at Chelsea?" the striker sneered. That was after Chelsea stars Courtois and Hazard both condemned France's tactics following Belgium's 1-0 defeat in St Petersburg on Tuesday night. Courtois said, "It's just an anti-football team", with Hazard adding, "I prefer to lose with this Belgium than win with that France". Reminding the Belgium duo of the result of the match, Griezmann said: "We don't care about it. We don't care how we played...we won." The 27-year-old warned the same would apply in tomorrow's final against Croatia, adding: "I don't care how, I want a second star to be on this shirt. That is all." Griezmann also sought to play down comparisons with Zinedine Zidane after team-mate Paul Pogba likened him to France's 1998 World Cup final hero. Pogba even dubbed Griezmann "Grizou" on Thursday, a variation on Zidane's nickname, "Zizou". "I don't like being called Grizou," Griezmann said. "I prefer Grizi." Asked whether, if they won tomorrow, France's class of 2018 would be remembered as "Griezmann's team" in the same way the '98 side became "Zidane's team", he added: "I don't know whose it will be. It doesn't matter. I just want to win this World Cup." The Zidane-Griezmann comparison is not the only parallel between France's 1998 and 2018 World Cup campaigns. Like 20 years ago, they have a centre-forward who cannot score - for Stephane Guivarc'h, read Olivier Giroud - an emerging superstar - Thierry Henry versus Kylian Mbappe - and a semi-final-winning defender - from Lilian Thuram to Samuel Umtiti. Griezmann is also responsible for encouraging one such comparison after taking to stroking team-mate Adil Rami's facial hair before each game. Twenty years ago, a similar ritual was performed by Laurent Blanc and Fabien Barthez, involving the former planting a kiss on the latter's bald head. Griezmann said: "I started to do it before the quarter-finals and it gave me luck. So, we're not changing this tradition and we'll keep on doing it." One of few members of the squad old enough to remember France's sole World Cup triumph, Griezmann vowed to do everything possible to emulate the feat. "In my home city of Macon, it was crazy when we reached the final," he said. "So I hope we will give the same pleasure to French people. "We have the potential to do something great and I hope we will be able to bring them back the cup." He added to laughter: "We have a beautiful country, we have a beautiful team, we have beautiful journalists! "So, we have to be proud to be French and I want young people to say, ‘Vive la France!'" The striker also joked about netting fewer goals at the World Cup than at the European Championship two years ago, when he finished top scorer but France were beaten by Portugal in the final. "As the best scorer, we lost," he said. "So I thought I would score a bit less goals to see if we win the cup!"